14 oz Box. 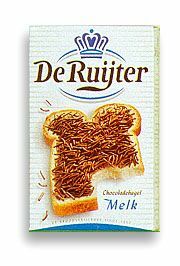 These famous Dutch Chocolate Sprinkles are made in Holland by De Ruyter. Commonly known in Holland as Melk Chocolade Muisjes or Hagel. Mostly used in Holland on a buttered slice of bread or toast, but also great for cake decorating or icecream topping.